What do you expect from a building? The question isn’t as strange as it seems. When you think about it, nearly every aspect of our lives depends in some way upon buildings. We live in homes, we work in offices, schools, stores, hospitals and other structures; we shop for groceries, we go to the car dealership for a new automobile, we eat in restaurants and dance in clubs. Except for those hardy types who thrive in the great outdoors, most of us spend the most significant parts of our lives in buildings, often without giving them a second thought. Danpal is encouraging you to give those buildings a few more thoughts. Imagine the 21st century if we still used outdated architectural practices and outmoded technology from the previous era. Imagine if, instead of using polycarbonate panels, we still opted to use metal U-panels? It’s hard to imagine why anyone would step back in time when construction has advanced so far ahead. But in case you have a building project and you’re still making up your mind about which materials to use, we’ll explain why polycarbonate panels have become the favorite choice of designers, engineers, architects, clients, and Planet Earth. We live in a period of time when buildings are designed to be in harmony both locally and globally. That focus mirrors the Danpal motto, Global Vision, Local Focus. 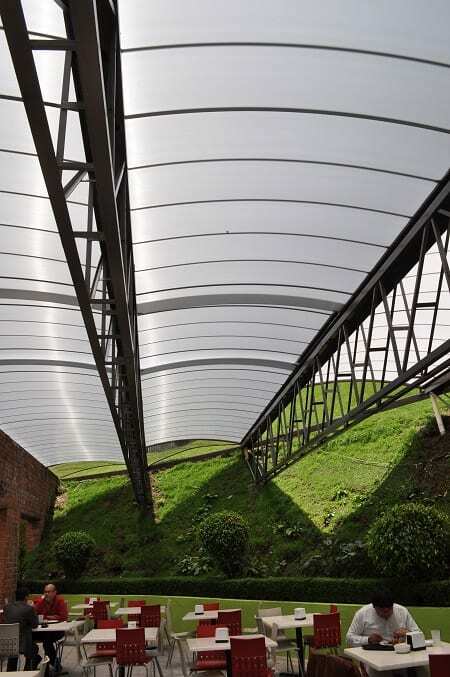 Polycarbonate standing seam panels are designed to maintain that atmosphere because they conform to the standards of a sustainable environment. Polycarbonate is a tough and durable material so that it can withstand rough weather, but it’s also flexible and easy to work with. Its high-impact resistance prevents hail from doing damage, yet its transparency to visible light allows it to provide much better transmission than glass can. Polycarbonate panels are so versatile that they’ve left glass and metal U panels behind in the race to the top for best building material. As the world becomes more conscious of the need to take better care of our planet, the momentum for sustainable living has captured the enthusiasm of the building industry. That’s why polycarbonate standing seam panels are so popular with people who care about the environment. The great news about that is that saving the environment also means saving money on energy costs, because polycarbonate is a material that provides high-quality insulation. If building materials were competing in a beauty pageant, it’s obvious that polycarbonate would easily defeat metal U panels and glass. That’s not just because polycarbonate standing seam panels are modern, strong and efficient. Danpal’s polycarbonate panels are designed with beauty in mind. Why choose boring metal or glass for your building when you can have daylight, color, translucence and reflections? Polycarbonate standing seam panels win the crown; metal U panels and glass are only runner-up.